The Chinese GP is live on 5 live and the BBC Sport website at 07:10 BSTSebastian Vettel admitted to being "surprised" at the size of Ferrari's advantage over the Mercedes cars in Chinese Grand Prix qualifying - but he said he would not be "if that gap disappears and it is a very tight race".That remains to be seen, but it is beginning to become clear that perceptions of this season within Formula 1 need to change.Mercedes were expected to have an advantage at the start of the season - and Vettel, at least until Saturday, has continued to press that point. But Lewis Hamilton has been saying for a while now that the teams are neck and neck. The world champion has been right - until Saturday, when it was not close at all, Vettel taking pole half a second clear of the closest Mercedes. Hamilton also said he cannot afford to lose any more ground to Vettel in China, where he arrived with a 17-point deficit in the championship. But he might well have to accept it and move on from there.With the fastest car and a front-row lock-out, it is hard to see how Vettel can lose this race, unless something goes badly wrong for Ferrari. If he does win, that would be three in a row at the start of a season, and no-one has done that and not gone on to win the championship. Kimi Raikkonen looked to have an edge on Ferrari team-mate Vettel for much of the weekend until the German's fastest 'purple' sector time in the final part of the final lap turned the tables in his favour. But no-one will be holding their breath expecting a challenge to Vettel from Raikkonen in the race.There is no publicly stated number-one driver policy at Ferrari, but it is widely believed Vettel does hold that status within the team.Raikkonen looked annoyed when strategy led to him losing victory in Monaco last year, less so when the position of the Ferraris was reversed during the pit-stop period in Vettel's victory in Australia last month. But if Raikkonen does not exactly say out loud that he is not allowed to beat Vettel if both are running together, he doesn't exactly work hard to give the opposite impression either.Here he is after qualifying, in answer to a question about whether he could beat his team-mate on Sunday: "Obviously first of all we need to make sure that we run a trouble-free race. Obviously that's the first point and then we have to see how it pans out, obviously, so it's a long race. "We know what we're going to do between ourselves so there's nothing… I think the start will be a big part of it and who knows? We will see how it pans out and what it brings but we need to make the best out of it. "When both men emphasise on a constant basis that the team comes first, it is not hard to work out what that means. Do Mercedes have a new 'diva'? Last year, Mercedes F1 boss Toto Wolff called his team's car a "diva" for its occasional capricious reluctance to respond to set-up changes in a predictable way. In Bahrain last weekend, he was asked whether the team had given birth to another one. He said no, but certainly this car is not doing what Mercedes want.In two consecutive races now, the Mercedes has struggled with its tyres - but in opposite ways. 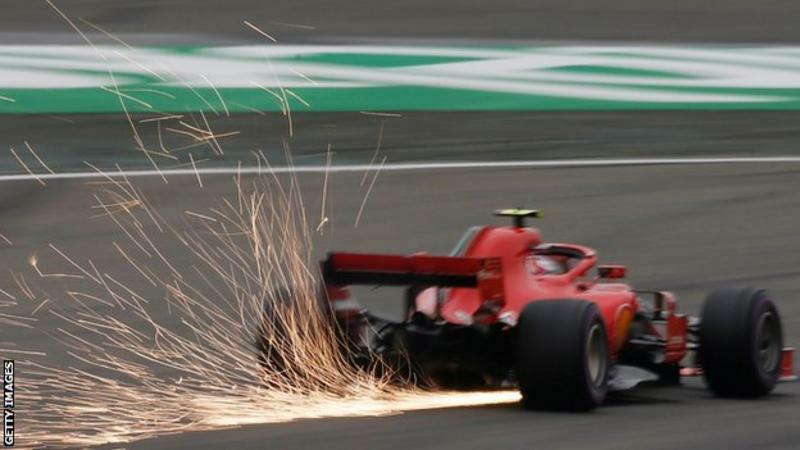 In the desert heat of Bahrain, they were overheating; in the chill of China, the drivers were struggling to get them up to temperature.The odd thing, as Valtteri Bottas pointed out, is that Mercedes are usually strong in cooler conditions.Hamilton has been emphasising how Ferrari's engine has "more power than everyone's currently somehow". But Bottas said: "They have a really strong car. We can see it (on the GPS data), especially in long corners. "Turn One-Two, they make some good gains to us and obviously without any speed difference on the straights, they can keep the gains they make in the corners - so we definitely have work to do. "The race remains an unknown, with hotter weather predicted. Hamilton said: "It is going to be interesting to see how it works out for us. We have not experienced that temperature so far this weekend. "They are rapid at the moment. That is a challenge but we will give it everything we've got. "We are half a second behind. We were quick in the last race but they were able to hold on. They'll probably be able to do that again." Red Bull divorce papers in the post? But the wider issue is that the Australian is now on his second internal combustion engine, turbo and both hybrid recovery units and he is only allowed three for the season. In addition to already being on his second of two permitted energy stores after the failure that caused his retirement from the race in Bahrain.Team boss Christian Horner said after the failure that "disappointment is probably an understatement". And the continued Renault reliability problems in year five of the hybrid programme - asked about dwindling faith in Renault's ability to sort it out, Ricciardo admitted that the "window of optimism reduces" - could make a switch to Honda more appealing.But that could be jumping out of the frying pan into the fire.After excelling in Bahrain last weekend, Toro Rosso, who took on the Honda engines this year after McLaren dropped them, are back to 15th and 17th on the grid - about where they were in Australia.Pierre Gasly, the star of Bahrain, said the car had lost grip and balance. But Honda's admitted problems with hybrid recovery and deployment won't be helping on a track with the longest straight in F1.Stick or twist? It's a question afflicting both the team in terms of its engine supply, and Ricciardo himself, whose contract is up at the end of the year and who may have opportunities at both Mercedes and Ferrari. Ferrari's wheel guns have sensors to measure both the tightness of the nut and the distance it has moved on to the wheel. But in Raikkonen's stop the mechanic on the left rear wheel missed the nut, but pressed the gun to undo it. He put the gun back on the nut to have another go but reversed the direction to tighten. That meant the system registered the nut as undone, then tightened and in the right place. So the sensor assumed the wheel had been changed when it hadn't, and gave the all-clear. The rear jack man and overall pit stop controller both hold buttons down which they release to turn the pit light to green. Both did this despite the problem on the left rear. The rear jack man didn't notice the wheel hadn't been changed and the controller was unsighted and did not see that corner of the car. Ferrari are to add an extra observer with an over-ride button in an attempt to ensure such a conflation of circumstances cannot happen again.Governing body the FIA is satisfied with this explanation. F1 director Charlie Whiting has some concerns about the spate of five pit-stop errors in three weekends and recognises these are down to the pressures on mechanics to get stops down to two seconds but is not minded a this stage to take action, such as forcing a minimum pit-stop time. He is happy with the safeguards the teams have in place.The FIA's position is that systems should be set up to eliminate the possibility of human error as much as possible but that the final one in releasing the car should be a conscious one by a person. Grosjean could be caught out by tyre performance in the race - better that than burning brakes, mindThe Chinese Grand Prix could develop into an interesting strategic battle. Not so much at the front, as both Ferrari and Mercedes will start on the soft tyre and likely try to get through with one stop. But those behind them in the top 10 will be on the ultra-soft, which degrades quickly, while those just outside such as Kevin Magnussen's Haas, Esteban Ocon's Force India and Fernando Alonso's McLaren, are likely to start on the soft and avoid the ultra-soft altogether. The Red Bulls will be out of reach, but that could give the drivers outside the top 10 a strategic advantage over those just in it - Renault's Nico Hulkenberg and Carlos Sainz, Force India's Sergio Perez and Haas' Romain Grosjean - and lead to shuffling of the order as the race progresses.For both Magnussen and Alonso, this was on Saturday evening softening the blow of qualifying results that were disappointing for different reasons.Magnussen, a star of the start of the season, had the pace all weekend, but a bad out-lap on his final run in Q2 left him struggling for tyre temperature. McLaren, meanwhile, have now qualified 13th and 14th in two consecutive races. As Alonso said: "The qually pace is not good enough and we have to analyse why. "The answer is obvious enough - the car is not quick enough, at least partly because it has too much drag. Despite Alonso's strong race performances - which currently have him fourth in the championship - McLaren expected far, far better than this following their switch to Renault engines and pressure is building as a result. Can the much-vaunted upgrades due in the next few races turn around what is rapidly becoming a deeply disappointing season for McLaren?